Tip: Want to try this on your own? Follow along in one of the many Getting Started Guideson spring.io. For developers new to Spring Boot, a great starting point is the Building an Application with Spring Boot guide. 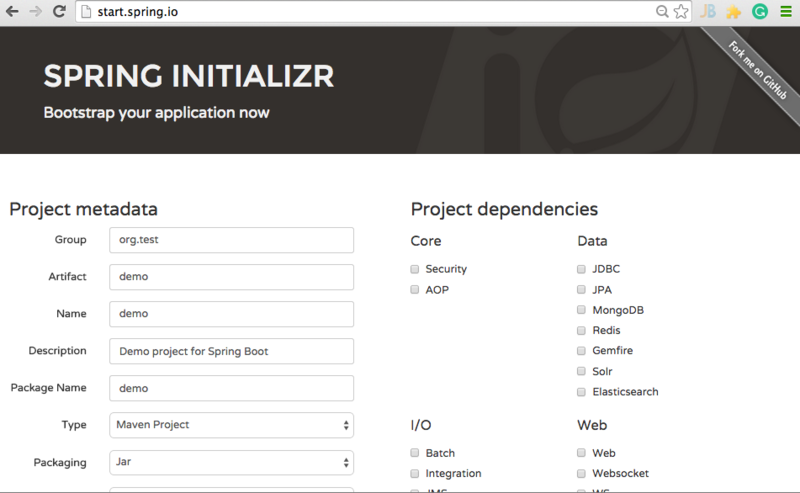 To get started with Spring Boot, you can point your browser at Spring Initializer -http://start.spring.io. Spring Initializer provides a web based interface allowing developers to select an application/workload and relevant dependencies. It will then generate a starter application with build support (supports Maven POM, Maven project, Gradle Config, Gradle project). Tip: Spring Boot provides support for project Reactor, making it simple to get started. Follow along in the Creating an Asynchronous, Event-Driven Application with ReactorGetting Started Guide to create your first reactive application. Also be sure to check out the webinar, Using Reactor for Asynch, non-blocking Microservices. Tip: Spring Boot makes configuring WebSocket applications a snap. Follow along with theUsing WebSocket to build an interactive web application guide to get rolling.